An actor playing the part of Marullus in blue toga addresses the camera to share his dissatisfaction. The intimate black box theater setting, free of distractions, allows Marullus’ facial expressions and tone of voice to clarify the meaning of his words. 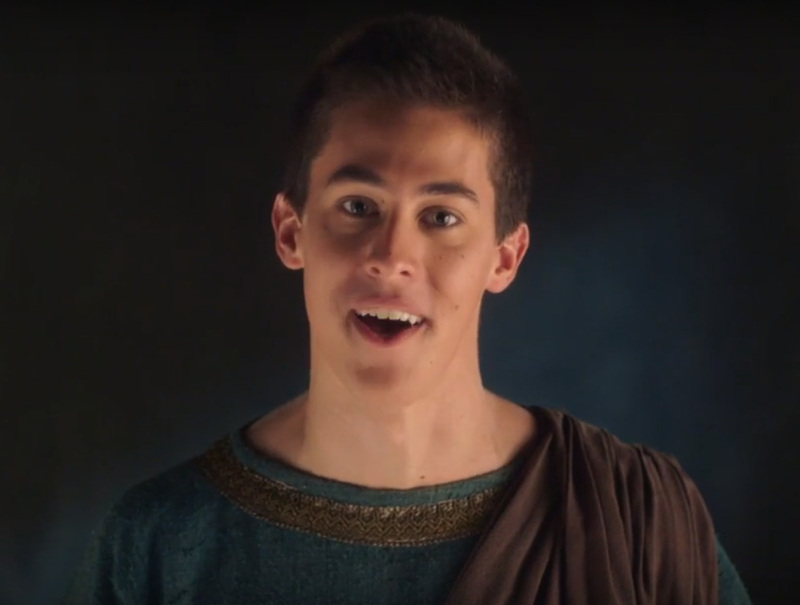 Shakespeare’s 400-year-old play, Julius Caesar is full of words and phrases we don’t use much or at all today, yet this performance video helps create an understanding of what Marullus is saying. Learning and teaching Shakespeare’s plays can be challenging for both students and teachers. Stanford University humanities teacher, Greg Watkins was looking for ways to make the plays accessible to his students. He started the myShakespeare project about ten years ago as an interview series of characters from the plays to introduce and reinforce learning moments. From early on, video and audio content for the multi-media project has been recorded at the Midpen Media Center. myShakespeare has grown over the years into a free web-based multimedia resource for anyone studying Shakespeare’s plays. Watkins says, “My instinct as a teacher of wanting to connect, believing in the depths and power of Shakespeare’s work, and trying to find a way for modern students to access the plays,” is behind his drive for creating the website. The myShakespeare team is comprised of Richard Clark, who lends his business expertise, educator Sally Treanor adds her teaching skills and Watkins is in charge of creative filmmaking. Julius Caesar is one of five plays ready for readers to explore through multimedia features on myShakespeare. Each scene of the play is presented on its own webpage. As you read through the original text icons in the margins of the page, offer greater detail about each section. Listen to audio recordings, read a modern translation, or watch a character performance of the text. Gain a greater understanding with definitions of parts of speech with video explainers highlighting vocabulary words. If you just need a refresher on what happened, read the act’s quick study guide. Offering multiple entry points to access the plays, myShakespeare is not a replacement for the original texts. Unlike other study aids that just summarize or offer a modern translation giving students the option not to explore the original text, myShakespeare has been set up to avoid that situation. “We hope to encourage students to go back and forth between Shakespeare and the clickable resources,” says Watkins. As students click between videos, audio, and text, they start to care about the play. Recently a teacher in New Orleans told the myShakespeare team his class used their version of Julius Caesar and put on an enthusiastic mock trial of Brutus, an activity suggested in the course material. The teacher said that because the students watched the performance and interview videos, they were much more deeply engaged with the text which set them up to want to do the assignment. Myshakespeare is achieving its goal of making the plays relevant and approachable for the 21st-century student.